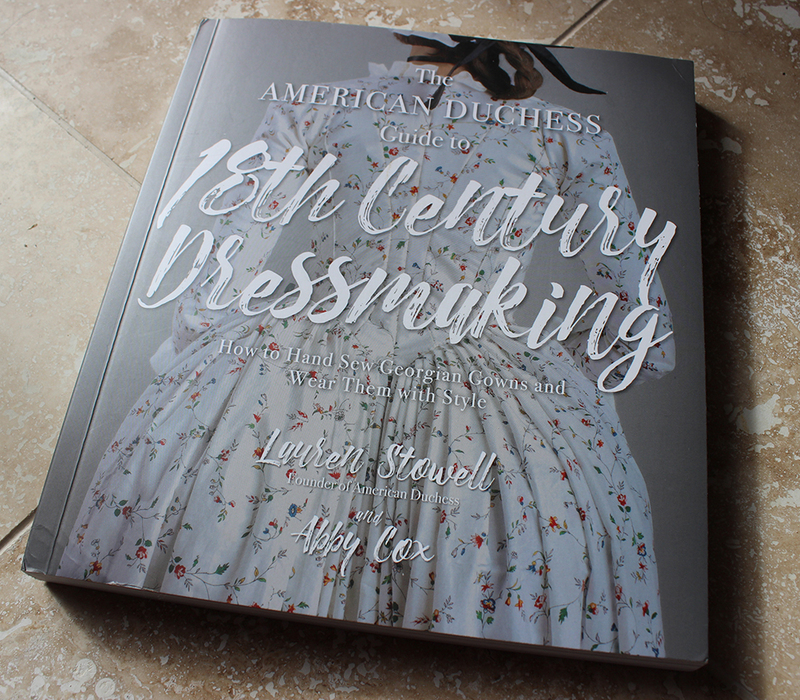 When Page Street Publishing contacted me and asked if I’d be interested in receiving the new American Duchess book in exchange for a review, I was positively delighted! Truth be told, I had already pre-ordered the book on Amazon, but receiving a copy before the official release and for review was very exciting! I have just finished reading through the whole book, cover to cover- not an easy task with a just barely one year old baby. But because this book is so visually appealing and so well broken down into sections, it was easy for me to keep my place and pick up and down as needed. I’m sure most of my readers are familiar with American Duchess, but if you are not, American Duchess is a company specializing in historical footwear styles. They started with the 18th century, and it seems to be a first love, but they also make footwear from the Renaissance through the early 20th century. They also have a sister company called Royal Vintage Shoes, which makes retro style footwear that is suitable for the 1920s through the 1950s, and easily integrates with modern styles as well. American Duchess doesn’t just do shoes, however. These two girls are powerhouses and have made sewing patterns for Simplicity, they blog, they do podcasts, live videos, and I’m sure they’ll be moving to even more endeavours in the future. The book is written and compiled by Lauren Stowell and Abby Cox. Lauren is the founder and president of American Duchess and Royal Vintage Shoes, a historical costumer, and an excellent illustrator and photographer. Abby Cox is vice president and previously worked for Colonial Williamsburg under the Margaret Hunter Millinery Shop, where they specialize in creating historical clothing using historical methods, and has done extensive study in the world of 18th century fashion. I believe what makes this book so great is the combining of these two very talented ladies. 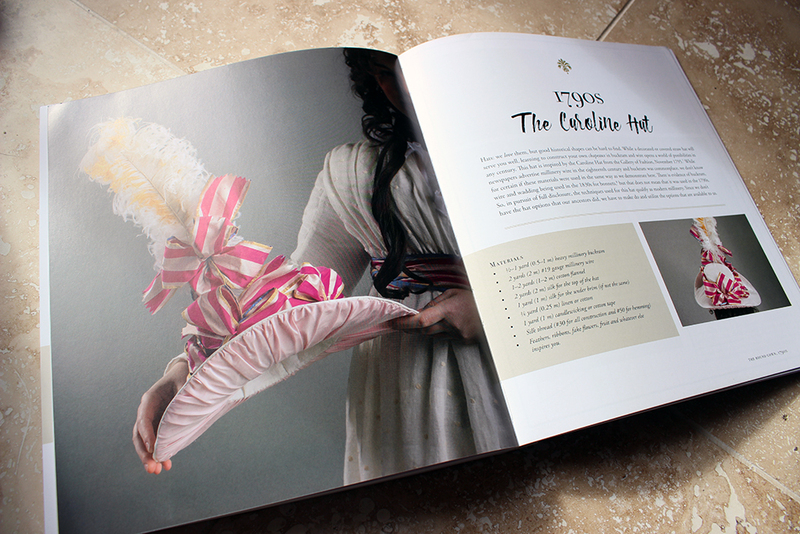 Both have equally great techniques and skills to bring to the table, and the book is not only a perfectly comprehensive textbook for creating historical clothing using historical methods, but it’s also visually a beautiful book to behold. The clear step-by-step photos, the illustrations, and the models all help make these techniques that I previously found to be extremely intimidating to be more attainable. Heck, even a die hard machine sewing person like myself feels like it might really be attainable to hand sew a gown. My personal experiences are from a modern fashion design and pattern making background. I was trained in a fashion school and I went on after graduation to work doing theatrical costuming in addition to my own hobby historical costuming. My methods, to be truthful, have relied heavily upon machine sewing and making things up as I go along- utilizing knowledge gleaned from my college training and on the job training in theatres, what I can make out from original historical garments, and personal study through vintage and antique textbooks and periodicals. But let’s be honest- for most of us, especially those of us on the west coast, 18th century resources are hard to come by. Seeing original garments up close is nigh impossible for most of us. And making sense and finding actual texts to base our recreations on is challenging to say the least. I may never go to Colonial Williamsburg, let alone ever have a chance to sew there. So to have this information laid out in a text is an valuable resource and so much different than the other books out there on clothing of this period since it makes construction comprehensive and not just academic. I know you all want to make incredible dresses, but here is something I need to mention. The book does not include any actual dress patterns. It goes over in detail why they opted to not include them, and I agree with their consensus. Let’s be honest- if dress patterns were included, the book would have to be a lot heftier than it is now. Explaining how to draft up patterns is something in itself! BUT, never fear! American Duchess has announced that they are releasing new patterns through Simplicity that were designed as companions for the book. So no dresses and no undergarments, but there are lots of beautiful accessory patterns included and the linings of each of the gowns is included so you can get the base from which to fit your gowns. All patterns need to be drafted up, and are provided on a 1″ grid to scale up. I mean just LOOK at that hat. JUST LOOK AT IT! It might be my favorite thing in the whole book. So, here’s my quick list of the pro’s and not con’s (because I don’t have anything bad to say about it), but balanced ideas, I guess. The lay flat binding. If you want to actually USE this book, this simple feature is very appreciated. You can lay it on your cutting table and get on with your business without it continually flapping closed on you. I know you guys know what I mean here. The “how to get dressed” features are super great for a visually oriented person like myself. Sometimes I really need things laid out in black and white when I’m doing a new era, and this does it. The troubleshooting guide at the back. Fitting is HARD, but this will help everyone achieve a more polished silhouette. I really appreciate that the dresses are shown on different models of different sizes. I also appreciate that the models are REAL COSTUMERS and not models hired just for the publication. They know how to wear the clothes and they look natural in them. The photos! LOTS and LOTS of photos! I’m a visual learner, so this is a big one for me. The text is informative, but still friendly. I appreciated that they presented it in a very down-to-earth way. As if to say “this seems tough, but you’ve got this!”. Sometimes we need that little boost when we’re trying something new. And it’s FUNNY in parts. I appreciate the sense of humour. They included the 1790s! I love the 1790s and so many 18th century books totally omit that very fascinating transitional period. So thanks for that, gals. The patterns for the linings are on a grid, and each gown was drafted for a different figure, but the page itself doesn’t specify measurements for the linings. This isn’t really a big thing, and it’s really common for costume books to not state the size. It would just be nice as a reference point. But, Lauren has said that they are planning on blogging things to do with the book, so perhaps this might be noted. In the meantime, just count the squares, and remember that seam allowances are not included. It gets a little overwhelming at times. This might just be me because I’m such a visual learner. When it’s going over a technique I’m not familiar with I’ve had to read and re-read. But don’t worry, because they’re teaming up with Jennifer of Historical Sewing, who is going to do video tutorials. Yay! It’s a whole lot of information to cram into a book, and to go through every single little bitty step would have been really hard. Since I’m not terribly familiar with the actual proper garment construction, I was a little murky on some of the construction bits, so flat technical drawings might have been a little beneficial in areas. For the 1740s gown I couldn’t for the life of me figure out where the lacing bits would go, but the “how to get dressed” part helped me figure it out. If you’re not familiar with sewing or basic draping, it might be a little challenging for you, but again, they’re teaming up with Historical Sewing, so they’ve got you covered! And the book gets the kitty mark of approval, too! I would like to thank Page Street Publishing for generously supplying me with a copy of the book in exchange for review. All thoughts expressed here are my own. And thank you to Lauren and Abby for generously supplying the costume world with their talents and making this incredible book to help our community make amazing costumes! « Free 1918 Knitting/Crochet Pattern! Ladies Sweater and Baby’s Cap and Sacque.